News and Case Studies from Denver Pain and Performance Solutions! In this next installment of our foot series, we are going to be taking a look at the anatomy of the ankle, the biomechanics of the ankle with particular emphasis on the talus and rearfoot tripod (yes, we have another tripod in the foot! ), and the role these structures play in our ability to supinate, pronate, and ultimately integrate our feet with the rest of the body. First, let’s review the anatomy of the ankle. The ankle is comprised of two primary joints, the subtalar joint and the talocrural joint. Just briefly watch a few seconds of the video below to get a visual of the structures involved. Pretty crazy right? What this means is that ankle function is of utmost importance. If our talus is malpositioned or unstable, it will adversely affect how muscles not only in the lower extremity, but throughout the entire body function. In order to restore and maintain optimal position and movement of the talus, we need to make sure to have adequate control through the pronation-supination continuum. We need to ensure that not only do the talocrural and subtalar joints of the ankle function well, but also ensure that the midfoot integrates with the ankle as well. If you read the previous foot tripod article, you might remember that we briefly talked about the importance of these joints and how to mobilize them. The ability to respond to load in these joints has a drastic effect on the talus and vice versa. Because we know the talus has large-scale effects on proprioceptive input and neuromuscular control, maintaining optimal foot function must involve the integration of the forefoot tripod, rearfoot tripod, and ankle joints. This is what will ultimately allow for the fluid control of pronation and supination in the foot and ankle. When we are talking about pronation and supination, we mostly associate these joint motions with walking gait. Pronation and supination allow the foot to have the dynamic stability required for shock absorption, as well as allow for the storing and releasing of kinetic energy through the lower extremities. The feet are highly involved in the Deep Longitudinal, Lateral, Anterior and Posterior Spiral kinetic chains. It at all starts with the feet. One simple way to think about supination is to liken it to inversion, or simply the foot pointing down-and-in. We mostly utilize the foot in a supinated position in gait when we are pushing off and extending through the hips. Pronation is simply the opposite; liken it to eversion, or the foot turning out and up. Our conversation around ankle mobility is most often centered around the idea of restoring dorsiflexion, which is primarily motion happening at the talocrural joint. Adequate ankle dorsiflexion is an important component for deep squats and activities like olympic lifting. However, as important as talocrural joint-focused ankle mobility is, we need to also appreciate the importance of subtalar joint function. I don’t think we talk enough about the rotational and lateral motions that also occur at the ankle when it comes to performance. Chronic instability or lack of mobility in the subtalar joint will often lead to issues like knee pain and hip immobility. This has implications with almost any athletic endeavor. In the case of the feet and ankles, my clinical experience has shown me that no matter what type of athlete you are, whether you are a weightlifter or runner, skier or cyclist, crossfitter or yogi, the feet and ankles are almost always in need of improvement. We usually get drastic improvements in strength, flexibility, power and overall athletic performance when we restore and maintain optimal foot and ankle function. My usual approach foot and ankle integration is focused on simplicity. What will give us the most bang for our buck with our self-administered corrective protocols? Typically, if the joints feel stiff and achy while performing these drills, chances are that they need improvement. Doing them regularly and prior to any lower body training days will help to slowly progress the function of the joints over time. Once we’ve mobilized the foot, the next step is to focus on integrating the foot and ankle with the knee, hip, and spine. There are many ways to do this depending on what your training goals are. However, I am of the opinion that the absolute best way to integrate the feet with the rest of the body is incredibly simple. The magic exercise that makes this happen that almost everyone needs to do more of is….. Yes, you read that right. Walking is one of the most under-appreciated and under-utilized forms of exercise out there. Granted, not everyone’s gait pattern is a thing of beauty, but even then I recommend more walking for improved overall function. More minimal the footwear the better. Chances are high that if we ensure the feet and ankles are functioning well, and we then integrate our feet and ankles with our walking gait through copious amounts of walking, we will be well on our way to functioning and feeling a lot better. Sometimes it is that simple. Rolling Patterns: Sequential rotation of the legs, hips, spine, and shoulders is incredibly important for walking gait. One of the primary problems that shows up in gait is a lack of rotation happening through the hips and thoracic spine. Rolling patterns are a great way to work on improving sequential rotation throughout the body, particularly because we can do so without loading the joints which helps to minimize compensation. I consider this to be a regression of walking. This drills does not allow you to use your large prime mover type muscles like your quads, lats, hamstrings, etc. and so you are forced to use your deeper stabilizing muscles predominantly. Slow Gait Walking: With any exercise, one way to really make sure you are owning it and able to do it properly is by slowing it down. Slowing things down forces you to recognize and work through suboptimal compensation strategies. Performing a skill more slowly forces you own each phase or aspect of that skill. By that logic, walking incredibly slowly will make it apparent to you where you might need to improve stability, or joint response, or load capacity. By slowing down, you can pay more attention to the areas that need improvement, and then incorporate additional drills that can improve upon and reintegrate the pieces that are not functioning optimally. If rolling patterns and slow, gait-mechanics-focused walking are feeling good, go walk! Walk your dog! Walk to work! Walk a handful of miles a week at least. It’s one the simplest and most effective ways of improving overall biomechanical function. The feet and ankles are one the most important key areas in the body when it comes to restoring and maintaining full-body biomechanical efficiency and movement capacity. The more efficiently we move and larger capacity we have for good movement, the smaller our chances are in regards to sustaining injuries, struggling with chronic pain, and greater our overall performance. Hopefully this article gave you guys some good insights and understanding as well as some useful tools to help facilitate better function in your feet and ankles! Stay tuned, we’re just getting started. Over the coming weeks and months, I will be continuing to write articles like this going through every area of the body. The foot is a very complex structure that is suited to handle several key tasks involving human movement. With 28 bones, articulating joints between each of those bones, and many muscles acting on those bones and joints, the foot can be a bit overwhelming when attempting to understand its intricacies in movement. When I work with clients, the feet are an area I am always paying attention to. Some of the most common dysfunctions and symptomatic presentations throughout the body often involve compromised function of the feet. If you think about how often we use our feet when we move, most of the time we are on our feet. Standing in line at the grocery store. Walking around the house cleaning. Commuting to work on foot. Going for a run. Hiking. Particularly with traditional strength training exercises like deadlifts, squats, and lunges, the feet are the foundation. In my estimation, the feet have several major functions. First, the feet provide the foundation for gait. In gait, the foot needs to dynamically stabilize and oscillate between pronation and supination to feed into the kinetic chains upstream. Secondly, the feet are rich with receptors providing copious amounts of feedback about body position, the surfaces we are walking on, balance, etc. Lastly, the foot often acts as a tripod to provide isometric stability during many different closed-chain exercises, particularly those that are common within traditional strength training methodologies like squatting, deadlifting ,lunging, etc. 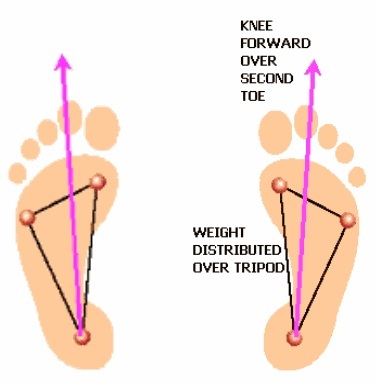 For the purposes of this article, we are focusing on the tripod function of the foot, briefly reviewing the anatomy, the role the foot tripod plays in providing a stable foundation for strength training, and some ways to improve the function of our foot tripod through exercises and drills. Let’s start by talking about the three-points that make up the foot tripod. First, we have the calcaneus (heel) as the first contact point. The medial contact point of the tripod is the first MTP joint or the first metatarsal head (ball of the foot). The lateral contact point is the head of the fifth MTP joint (base of the pinky toe). See the points highlighted below. Easy enough to conceptualize and visualize, right? Understanding the structure of the tripod is important. We need each of these three points to be able to maintain contact with the ground. If one point cannot engage with the floor, then the rest of structure above (lower leg, knee, upper leg, hip) will have its alignment and function compromised during movement. For example, an inability to load the medial contact point typically leads to excessive pronation, which often creates a cascade of rotational compensation in the knee, hip, and pelvis. While there are more than just 4 muscles that have a direct impact on the structural integrity of the foot tripod, these are the main players. The posterior tibialis helps to supinate (think – “turn in”) the foot, which lifts the arch, facilitating inversion of the ankle. The abductor hallucis is key in controlling the “gripping” or “reaching” movement of the big toe through the midfoot. The extensor hallucis brevis is important in how it affects the first MTP joint, allowing the ball of the foot to settle onto the ground instead of the pad of the big toe simply just pressing into the floor. The flexor hallucis brevis runs through the sesamoid bones (for mechanical advantage) and ultimately helps the 1st metatarsal (big toe) to press down and engage with the floor, similarly to the abductor hallucis. Each of these muscles help provide structural integrity of the foot arch. Being able to have a normal foot arch is paramount for having a stable and functional foot tripod. If there are dysfunctional relationships between the ankle, rearfoot, midfoot, forefoot, or toes, our arch and thus our tripod will function less than optimally. Other than low-back pain, knee pain might be the most common pain out there, for both sedentary folks and high level athletes alike. Not taking into consideration acute trauma to the knee, such as ACL sprains or meniscus tears, knee pain is most often a product of mechanical stress created by dysfunction in the feet or hips. Not spending enough time on our feet, coupled with the fact that the time we do spend on our feet is typically in cushioned footwear, is not a recipe for healthy and functional feet. When someone comes to see me with knee pain, 8 out of 10 times, improving their foot function resolves their knee issues. Inability to bear weight on outside of the foot will emphasize the medial quads, hamstrings, calves, and adductors. Inability to bear weight on inside of the foot will emphasize the lateral quads, hamstrings, and calves. Inability to load the forefoot will often lead to synergistic dominance of the toe extensors and lumbar erectors. Inability to load the rearfoot (heel) will often lead to synergistic dominance of the distal quads and adductors. An unstable foot tripod will lead to an inability to load at least one part of the foot. For the sake of simplicity (foot mechanics are anything but simple), we are referring mostly to closed-chain (foot is in contact with the ground or a platform) exercises like squats, deadlifts, and lunges. An inability to load any given part of the foot is a problem when you’re working with appreciable loads. If you can’t efficiently distribute load through the whole foot, you will inevitably compensate somewhere further up in the kinetic chains. As previously mentioned, suboptimal compensation usually leads to mechanical stress on adjacent structures like the knees, hips, pelvis, and lower spine. The key to a functional capacity for lower body strength training starts with the foot. Establishing a functional foot tripod is the first step in restoring and maintaining healthy feet. After we learn how to create isometric stability in our feet via our tripod, we can then branch out and start to explore the dynamic stability of our feet on the pronation-supination continuum. But we will save that for another day. Try this: Stand hip width apart with your glutes engaged so your pelvis is in neutral alignment, and lift just your toes off the ground. Can you feel the 2 forefoot tripod points? How about if you start to bend at the knees and hips to initiate a squat? If not, there is a compromise in your ability to load either the inside of the outside of the foot properly. This will lead to inefficient loading in the primary leg and hip muscles. In order to restore our foot tripod we need to improve mobility within the bones and joints of the foot. If the bones can’t move, it’s typically indicative that they do not have the capacity for load. If either the structural integrity of the joint, or the muscular support required to stabilize the joint during any given movement are not functioning optimally, the nervous system often creates compression in the joint in an attempt to create stability. This is a less than ideal compensation strategy. While it makes the joint more stable, it also decreases joint space, increases mechanical stress in the joint, and creates short-circuiting of the muscles (tight, painful, weak) that act on that joint. In my experience, the quickest and most effective way to restore mobility in a joint is to specifically assess and correct neurological compensation via specific manual therapy techniques like P-DTR. Manual adjustments performed by a qualified professional can sometimes be helpful and necessary. Problem is that they often don’t stick. The way to make manual adjustments stick is to reinforce and integrate the adjustments or mobilizations with movement. One of the best self-administered ways of improving joint mobility over time is through gentle joint flossing drills. 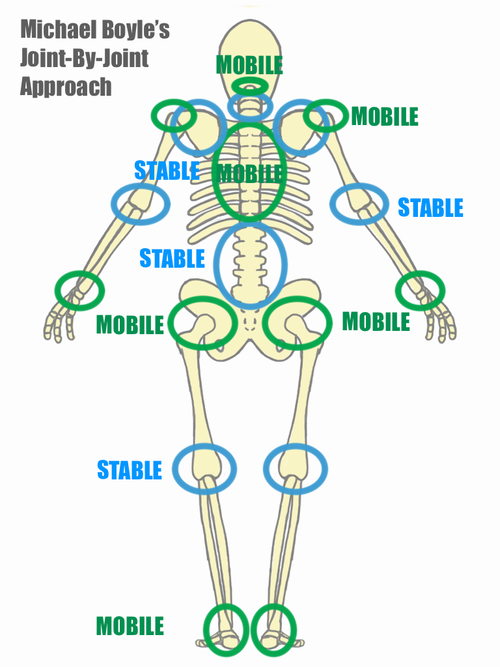 By progressively subjecting the joints to mobilization techniques that allow the joints and muscles to adapt over time, both the structure and nervous system will process and manage the movements better. Three key areas to ensure have the requisite bone-on-bone mobility are the calcaneus, cuboid, and navicular. Each of these midfoot bones’ ability to load is paramount for foot tripod function. Here are three drills that I have had tremendous success utilizing with myself and with clients to help restore mobility in the calcaneus, cuboid, and navicular bones of the feet. From here, there are no shortage of other drills you can use to specifically address whatever deficiencies your feet might have. To start, I suggest trying out the above drills, and then training bearfoot more often, especially on your lower body focused training days. The feet can be understood and broken down so many different ways. Hopefully this perspective is helpful in better understanding the foot tripod. Plenty more information on the feet is in the works.